I guess I updated on FB but not here -- Tigger was very ill, and we lost her a week ago. Today we scattered her ashes in the yard. Salem seems to have entirely bounced back from her health crisis, which is good, although we're still a little worried about the Italy trip, even if we have an excellent pet-sitter and a friend coming to give her some company. 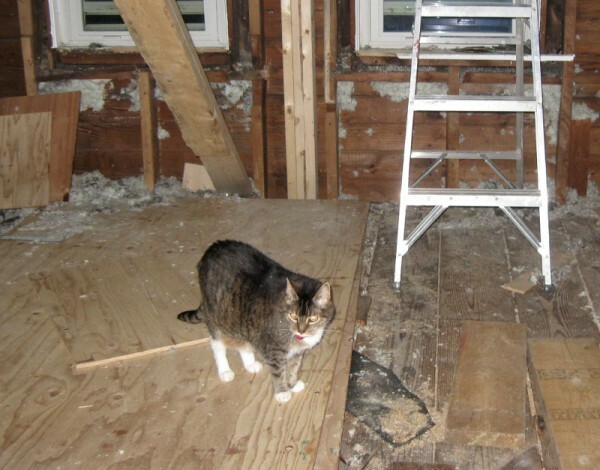 Here she is, a few years back, excited to explore the construction we were doing on the house. Farewell, our good little girl. This entry was originally posted at http://antimony.dreamwidth.org/8366.html. Please comment wherever you prefer.